Pentecostalism or Classical Pentecostalism believe that all Real Christians are Pentecostals or Charismatics and is a renewal movement within Christianity that places special emphasis on a direct personal experience of God through the Lordship of Jesus Christ, baptism with the Holy Spirit leading to Holy Spirit–filled and empowered life as well as biblical authority, and the miraculous, personal empowerment which includes the use of spiritual gifts. Pentecostals tend to also see their movement as reflecting the same kind of spiritual power and teachings that were found in the Apostolic Age of the early church. For this reason, some Pentecostals also use the term Apostolic or full gospel to describe their movement. Real Pentecostals do practice and believe and in an authentic relationship with God, the Holy Spirit, Jesus Christ, the Trinity, stemming from simple conversation with them through prayers and even fasting. They tend to believe a Christian can both be demon possessed and can lose their personal Salvation as well. They tend to put a greater emphasis on prayer over Bible reading, and thus can still even have some personal errors.. Pentecostalism as a whole now even follows four core doctrines: salvation, divine healing, baptism of the Holy Spirit, and the second coming of Christ as well as a Mission to others. These missions include to evangelize the lost, the praise and worship of God, to teach and disciple believers, and to show practical, real compassion to the poor and needy. Some Pentecostals groups still falsely teach and demand tithing. Others now falsely allow divorce. Many Pentecostals also put emphasis on the latter rain outpouring, Believing that we all were living in the end times, they expect God to presently spiritually renew the Christian Church bringing to pass not only the restoration of spiritual gifts, but also the evangelization of the whole world by the re-establishment and the mutual submission of the offices of Apostles, Prophets, Pastors teachers, evangelists. It should be noted some Pastors falsely object to their submission to others. The Pentecostals do now differ very significantly from the other main Christian Denominations including the Mennonites, Brethren, Baptists, Catholics, Anglican, Presbyterian for they preach the whole or full Gospel of Jesus Christ; Jesus as Savior, Healer, Deliverer, Provider, coming King, Baptizer of the Holy Ghosts, Sanctifier, Giver of gifts too… and yet this denomination basically is not more spiritual over the others, mainly because the leadership has watered down the requirements of what it takes to be a Christian, a church member .. apparently you can often buy a membership by tithing, giving ten percent of your income to the local church.. While there are many similar evidently aspects of the Pentecostals such as the main emphasis on not only Jesus, His salvation, forgiveness but also on the Holy sprit, leading , gifts, empowering each local Church tends to differ, some seriously even depart from the faith in reality, have accepted falsehoods, lies, distortions into their midst, doctrines like many other denominations now too. I do deal with some of these issues too. Acts 8:14 Now when the apostles which were at Jerusalem heard that Samaria had received the word of God, they sent unto them Peter and John: 15 Who, when they were come down, prayed for them, that they might receive th…e Holy Ghost:16 (For as yet he was fallen upon none of them: only they were baptized in the name of the Lord Jesus. )17 Then laid they their hands on them, and they received the Holy Ghost. as a result of the anointing of of the Holy Spirit ( Acts 10:38) and you will reflect, be more and more conformed to the image of Christ (Romans 12:2; 2 Corinthians 3:18). Your prayer life and study of God’s Word will become more meaningful. You will experience His power in witnessing (Acts 1:8). You will be prepared for spiritual conflict against the world (1 John 2:15-17); against the flesh (Galatians 5:16-17); and against Satan (1 Peter 5:7-9; Ephesians 6:10-13). You will experience His power to resist temptation and sin (1 Corinthians 10:13; Philippians 4:13; Ephesians 1:19-23; 2 Timothy 1:7; Romans 6:1-16). Acts 10:38 38 How God anointed Jesus of Nazareth with the Holy Ghost and with power: who went about doing good, and healing all that were oppressed of the devil; for God was with him. Romans 8:9 But ye are not in the flesh, but in the Spirit, if so be that the Spirit of God dwell in you. Now if any man have not the Spirit of Christ, he is none of his. The Holy Christian life is personally… impossible, it is impossible without the Holy Spirit –on our own. Trying to live the Christian life by your own efforts is like a ship trying to sail on dry land… Ephesians 5: 1 Be ye therefore followers of God, as dear children; 2 And walk in love, as Christ also hath loved us, and hath given himself for us an offering and a sacrifice to God for a sweetsmelling savour. 3 But fornication, and all uncleanness, or covetousness, let it not be once named among you, as becometh saints; 4 Neither filthiness, nor foolish talking, nor jesting, which are not convenient: but rather giving of thanks. 5 For this ye know, that no whoremonger, nor unclean person, nor covetous man, who is an idolater, hath any inheritance in the kingdom of Christ and of God. 6 Let no man deceive you with vain words: for because of these things cometh the wrath of God upon the children of disobedience. 7 Be not ye therefore partakers with them. 8 For ye were sometimes darkness, but now are ye light in the Lord: walk as children of light: 9 (For the fruit of the Spirit is in all goodness and righteousness and truth;) 10 Proving what is acceptable unto the Lord. 11 And have no fellowship with the unfruitful works of darkness, but rather reprove them. 12 For it is a shame even to speak of those things which are done of them in secret. 13 But all things that are reproved are made manifest by the light: for whatsoever doth make manifest is light. 14 Wherefore he saith, Awake thou that sleepest, and arise from the dead, and Christ shall give thee light. 15 See then that ye walk circumspectly, not as fools, but as wise, 16 Redeeming the time, because the days are evil. 17 Wherefore be ye not unwise, but understanding what the will of the Lord is. 18 And be not drunk with wine, wherein is excess; but be filled with the Spirit; 19 Speaking to yourselves in psalms and hymns and spiritual songs, singing and making melody in your heart to the Lord; 20 Giving thanks always for all things unto God and the Father in the name of our Lord Jesus Christ; 21 Submitting yourselves one to another in the fear of God. 22 Wives, submit yourselves unto your own husbands, as unto the Lord. 23 For the husband is the head of the wife, even as Christ is the head of the church: and he is the saviour of the body. 24 Therefore as the church is subject unto Christ, so let the wives be to their own husbands in every thing. 25 Husbands, love your wives, even as Christ also loved the church, and gave himself for it; 26 That he might sanctify and cleanse it with the washing of water by the word, 27 That he might present it to himself a glorious church, not having spot, or wrinkle, or any such thing; but that it should be holy and without blemish. 28 So ought men to love their wives as their own bodies. He that loveth his wife loveth himself. 29 For no man ever yet hated his own flesh; but nourisheth and cherisheth it, even as the Lord the church: 30 For we are members of his body, of his flesh, and of his bones. 31 For this cause shall a man leave his father and mother, and shall be joined unto his wife, and they two shall be one flesh. 32 This is a great mystery: but I speak concerning Christ and the church. 33 Nevertheless let every one of you in particular so love his wife even as himself; and the wife see that she reverence her husband. Hebrews 11:4 By faith Abel offered unto God a more excellent sacrifice than Cain, by which he obtained witness that he was righteous, God testifying of his gifts: and by it he being dead yet speaketh. 1 John 3:12 Not as Cain, who was of that wicked one, and slew his brother. And wherefore slew he him? Because his own works were evil, and his brother’s righteous. Jude 1:11 Woe unto them! for they have gone in the way of Cain, and ran greedily after the error of Balaam for reward, and perished in the gainsaying of Core. One of the biggest tragedy of Christianity is that many professing Christians are falsely trying to make themselves look good, better over others by doing their own thing, earning their way to heaven in the same way that Cain had falsely refused to do what God had told him.. As a real Christian you are Holy Spirit filled Christian and taught lead by the Holy Spirit or you are a carnal Christian or an unchristian, a natural man and thus you do still hold mostly false Biblical insights. and it will clearly show as to who you are by what you believe in, but what you say and also but also with whom you do associate with.. There are not a multiple optional possibility of beliefs or of truths in God Kingdoms You are Holy Spirit filled or are led by the devil.. as simple as that Carnal Christians are so close to being unbelievers that they are almost indistinguishable from them. Likely will go to hell with them next too. Such Christians are characterized by apathy, division, ongoing strife and a very low EQ! Carnal Christians “bite and devour one another” (Galatians 5:15) “And I brethren, could not speak to you as to spiritual men, but as to carnal men, as to babes in Christ. I gave you milk to drink, not solid food; for you were not yet able to receive it. Indeed, even now you are not yet able, for you are still carnal. For since there is jealousy and strife among you, are you not fleshy, and are you not walking like mere men?” It is the Holy Spirit who renews, transforms, redeems our perceptions, beliefs, emotions, and physical bodies and who gives us the wisdom, discernments, insights. as “I have been crucified with Christ: and I myself no longer live, but Christ lives in me. And the real life I now have within this body is a result of my trusting in the Son of God, who loved me and gave himself for me” (Galatians 2:20). 1 Thessalonians 4: 1 Furthermore then we beseech you, brethren, and exhort you by the Lord Jesus, that as ye have received of us how ye ought to walk and to please God, so ye would abound more and more. 2 For ye know what commandments we gave you by the Lord Jesus. 3 For this is the will of God, even your sanctification, that ye should abstain from fornication: 4 That every one of you should know how to possess his vessel in sanctification and honour; 5 Not in the lust of concupiscence, even as the Gentiles which know not God: 6 That no man go beyond and defraud his brother in any matter: because that the Lord is the avenger of all such, as we also have forewarned you and testified. 7 For God hath not called us unto uncleanness, but unto holiness. 8 He therefore that despiseth, despiseth not man, but God, who hath also given unto us his holy Spirit. 9 But as touching brotherly love ye need not that I write unto you: for ye yourselves are taught of God to love one another. Why aren’t more Christians filled with the Spirit? Simply because of their unsubmitted, unconfessed sin. We thus do still choose to disobey God. This can take the form of pride: doing and wanting things our way. Living a self centered life, and We don’t give God control of our finances; we’ve worked hard for our money and it’s ours now. We don’t give God control of our relationships, associates, choices too;. We don’t give God control of our personal morality; that’s nobody’s business but our own—not even God’s. (Proverbs 3:34). [God] mocks proud mockers but gives grace to the humble” Proverbs 29: 23 A man’s pride shall bring him low: but honour shall uphold the humble in spirit.24 Whoso is partner with a thief hateth his own soul: he heareth cursing, and bewrayeth it not. 25 The fear of man bringeth a snare: but whoso putteth his trust in the LORD shall be safe. 26 Many seek the ruler’s favour; but every man’s judgment cometh from the LORD. 27 An unjust man is an abomination to the just: and he that is upright in the way is abomination to the wicked. Or the “Fear of man will prove to be our snare…” (Proverbs 29:25). Is there something that God wants you to do, but you haven’t done it because you’re afraid of what people will think? Generally non-believers, non Christians are clearly still totally ignorant the work of the Holy Spirit. (1 Corinthians 3:1-3). “A natural man does not accept the things of the Spirit of God; for they are foolishness to him, and he cannot understand them, because they are spiritually appraised” (1 Corinthians 2:14). But “He who is spiritual appraises all things…We have the mind of Christ” (1 Corinthians 2:15). see also To be Baptized with the Holy Spirit first you must be a true Christian, a true follower of Jesus Christ “Yet now hear, O Jacob my servant; and Israel, whom I have chosen: Thus saith the Lord that made thee, and formed thee from the womb, which will help thee; Fear not, O Jacob, my servant; and thou, Jesurun, (the upright one) whom I have chosen. For I will pour water upon him that is thirsty and floods upon the dry ground: I will pour my spirit upon thy seed, and my blessing upon thine offspring: And they shall spring up as among the grass, as willows by the water courses.” (Isa. 44:1-4) (Psa 37:9 KJV) For evildoers shall be cut off: but those that wait upon the LORD, they shall inherit the earth. (Psa 37:10 KJV) For yet a little while, and the wicked shall not be: yea, thou shalt diligently consider his place, and it shall not be. 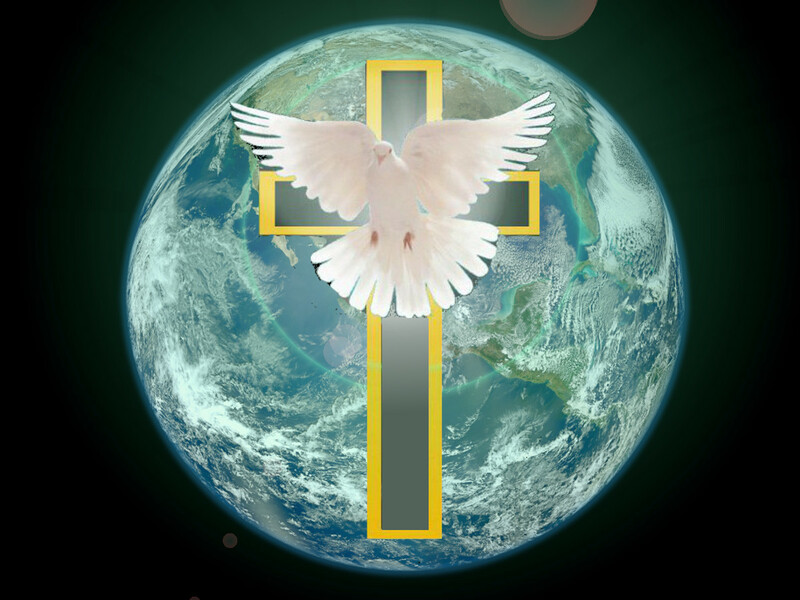 (Psa 37:11 KJV) But the meek shall inherit the earth; and shall delight themselves in the abundance of peace. BEING RELGIOUS AND/OR KNOWING THE BIBLE IS NOT THE SAME AS KNOWING PERSONALY GOD, JESUS CHRIST, THE HOLY SPIRIT.. GOD, JESUS CHRIST, THE HOLY SPIRIT, all do love you and they had created you to know them personally-here was a basic, truthful fact – you must know, remember and share with others too. God the father, Jesus Christ, and the Holy Spirit are all alive, real, individuals who care about you personally too and desire now to fellowship with you too if you do now meet their requirements, conditions as stated in the New Testament. Or are you falsely still relying in your own flesh in following Jesus Christ, God, the Holy Spirit? … Did you know that the Bible teaches us that human nature will always deny Jesus Christ. We all first must come personally to Jesus Christ in order to receive the baptism of Holy Spirit as well.. Now without the Holy Spirit of Jesus in your life, heart, you can only know, experience, darkness, demons and not God. Our boldness comes from being with Jesus, the Holy Spirit and our knowledge, application of God’s word. We can’t change one thing about ourselves or others without the SPIRIT of GOD. (Luke 4:1 KJV) And Jesus being full of the Holy Ghost returned from Jordan, and was led by the Spirit into the wilderness, (Rom 8:14 KJV) For as many as are led by the Spirit of God, they are the sons of God. GOD is still looking for the caring, loving spirit filled people who have made the LORD JESUS CHRIST only and not others as their Hope and Confidence. GOD now wants to get down to the heart of things and make you as Free as you can be, so you can just fully enjoy being His Child. Lift up your head for the Kingdom of God will come upon you too, if you seek Him, and you will next see more of God’s SPIRIT on display than ever before. You will also personally Rejoice in what God’s promised for His Church, and you will with joy also now know that you’re on your way up being lifted up in Him too. GOD still does have something bigger for each one of us he has planned for us more than we have even imagined. He by his Holy Spirit is fueling and leading us the whole way. GOD is decking us out with His Garments, garments of holiness, power, and praise included, and He is also calling us to personally move into His own places of Authority here on earth. This Hand of GOD is lifting us up and giving us the Passion that also His SON had, has. This Anointed Holy Spirit Hand of GOD is also bringing his Favor and releasing us to His Kingdom best. GOD now still wants to be every bit a living part of our lives as we daily do His. GOD can show us more as to what it takes to know Him on a one on one basis, to know him more, and to make His Name Great in the earth. With God’s supplied Power and Passion in the Holy Spirit we can turn around many things for His glory, and we will be right in the center where GOD wants us all the time to be, and not only to receive but to pour out as well. Yes it is really true that GOD wants to fill your cup with his Holy Spirit and to make you also an important somebody in His Kingdom filled with praise, love, humbleness and power too. Any genuine revival of the Holy Spirit is a personal one firstly.. it is to affects us personally first. Then we can share it with those around us and those abroad. The HOLY GHOST brings our personal Restoration to God, He can bring it to the whole Church as well and get It up into God’s Will. He will also take those persons going through trials and prepare them for a personal, individual Ministry, for He Enables those who have now been Called, and he can get us all working in His Order, and Fills us with Joy and Settle us individually and solidly in JESUS. The Holy Spirit Anointing Calls us into our own ministry, service and he Challenges us to give up our life as we know it, it as more than going from childhood into adulthood, for it Announces God’s Favor, Increases our Awareness of the Spirit’s Work, Bridges gaps between God and man and ir makes many things right, and as well he gives us More of JESUS. We thus will be are Refreshed in His Presence, we will feel more Strongly about the Things of GOD, God’s Will will be made clearer to us, and our useless, old worries are Removed In Christ by His Holy Spirit we have a New enabled Mission, Ministry, Service for we not only take on a New Nature, but we are being continually Led, Fed by Him as well The Outpouring of the HOLY SPIRIT while it often is still unpredictable, it is always in His time, and it is the beginning and also summation of our Faith in the Hand of the LORD to take his own direct actions here on earth, it is God’s Person on Display, it also is something New everyday, and it can make everybody who receives it Happy, in the World To Come in the here and now too… with even abundant Joy. Seek Him, find him, take hold of Him, and above all keep him at all costs.. and all available now to us freely through Jesus Christ, to him be all the glory, the majesty always. GOD wants to set you apart. He wants you to have His Passion for everything. GOD is on the move in the earth today and He needs, uses the people full of His HOLY SPIRIT. This entry was posted in Christianity, Holy Spirit Life and tagged Charismatic, Charismatics, Christian, Christianity, Church, churches, deacons, Discernment, elders, gift of discernment, God, Holy Spirit, Jesus, pastors, Pentecostals, Prophets, protestant, Real Pentecostals, religion, Spirit Filled, spiritual, Spiritual gifts, Theology. Bookmark the permalink.